Rongker is the major springtime annual festival celebrated among Karbis in the month of April at the same time Punjab celebrates Baisakhi, Assamese celebrates Rongali Bihu. Karbis are are of the major ethnic groups in North-east India and especially in the hill areas of Assam. They are the primary habitants of the Karbi Anglong district. These people are mainly found in North Cachar district, Kamrup, Nagaon and Sonitpur district of Assam. The main reason for celebrating this festival is to make the people free from the diseases and natural calamities throughout the year and also seek the blessings for bounteous yield of crops. This festival celebrate to propitiate different gods and goddesses for the well being of the entire village, the elderly male folk organise Rongker so thatpeople can be free from diseases and natural calamities for the entire year. The women are not allowed to enter the worship arena during this festival. The festival does not have any specific time although it is usually observed at the beginning of the New Year (month of April). Different villages may observe it at different time depending entirely on their convenience. In order to meet the expenses of the rituals, conected with the festival, the whole village contributes in cash and kinds. Sometimes subscription and donation are also collected from the neighbouring villages. 1) Sadi: The Process of inviting the deities. 2) Karkli: Worship of the deities. This part can again be subdivided into two parts..
A) Kibo-Kaba: Offering of meals to the deities. B) Koia-abida: Offering of areca-nut and betel leaves to the deities. 4) Langhe Rongker: Concluding part of Rongker performed near a bathing "ghat" to prevent attact by tigers. All together 12 deities are worshiped for the Rongker festival. 1) Longri sarpo : The is the presiding deity for the Festival Rongker. The deity is the Local god where the village , which is conducting the festival falls. This deity is responsible for the welfare of the the Longri ( meaning Kingdom or jurisdiction). 2)Hemphoo : The supreme household god of the Karbis , believed by some of the scholar to be " Vishnu of hindu mythology "
3) Mukrang : He is also a households god, His position is next to Hemphoo believed by some scholar to be " Mahadeva of hindu mythology" . 4) Rosingja : A domestic goddess of the Karbis, She enjoys a position next to Hemphoo Mukrang in the hierarchy. 5) Bamun : A local deity believed to be vegetarian. 6) Ningding Sarpo : The god of Patience. 7) Rit-Anglong : The deity in-charge of agriculture. 8 ) Than : Another local deity who lives in the jungle. It is believed that this deity can protect the crops and people from wild animals ans insects etc. 9) Murti: A headless malevolent spirit who lives in a hole under the earth. 10) Arlock : The deity who lives in a land that stands between two hills. 12) Theng : It is another deity who lives in the jungle and can cure some deases like flue, body ache, head ache, tooth-ache and other physical pains. 1) Husking is prohibited during the performance of the Rongker in the Village. 2) Participation of the female folk in any part of the Rongker is strictly prohibited. 3) No one is alowed to go to "Aar" (Jhum Cultivation) or any agriculture activities. 4) No villager is allowed to leave the village during the performance of the Rongker. On the other hand, Chomangkan is the festival dedicated to the dead. It is primarily a death ceremony. Although, the Karbis perform the funeral ceremony at the time of the cremation of the deceased, they also perform the death ceremony called "Chomangkan" at a later date for the eternal peace of the deceased. It is the most elaborate and expensive socio-religious ceremony of the Karbis which containues for four days and four nights non-stop.The ceremony does not require any formal invitation and all are welcome to it. In spite of the sad undertone, it is the proud day for the family and they welcome all with great warmth. 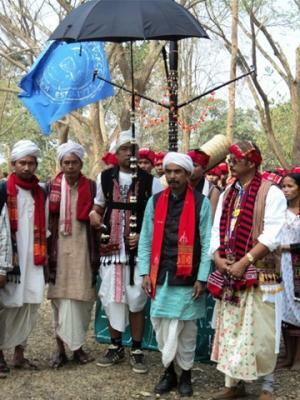 They come in batches and everyone carries a symbolical rod with 5(five) branches and at the end of each branch, there is a wooden bird, which is called in Karbi "Vo-rali". The whole rod is called "Jambili Athan". This is the symbolical representation of the tribe and it is also the symbol of clan unity. This festival is a must for every Karbi. It is a nonstop four days and four nights celebration.